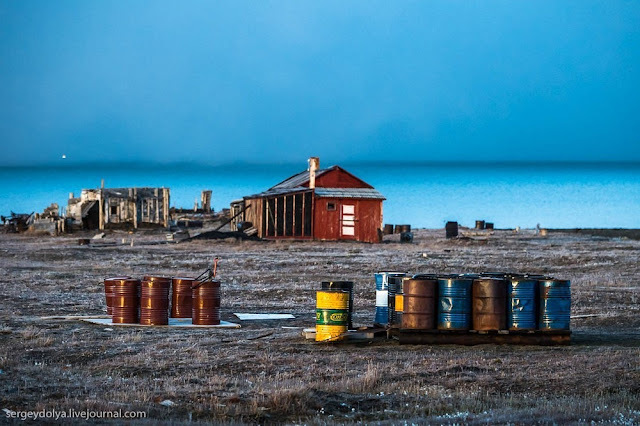 Wrangel Island, in the Arctic Ocean, is one of the most remote islands in Russia. Straddling the International Date Line—the boundary where the eastern and the western hemisphere meet—this rugged volcanic island, where summer temperatures barely climb above freezing, is believed to have been the last place on earth where the wooly mammoth survived, six thousand years after their cousins on the mainland disappeared. 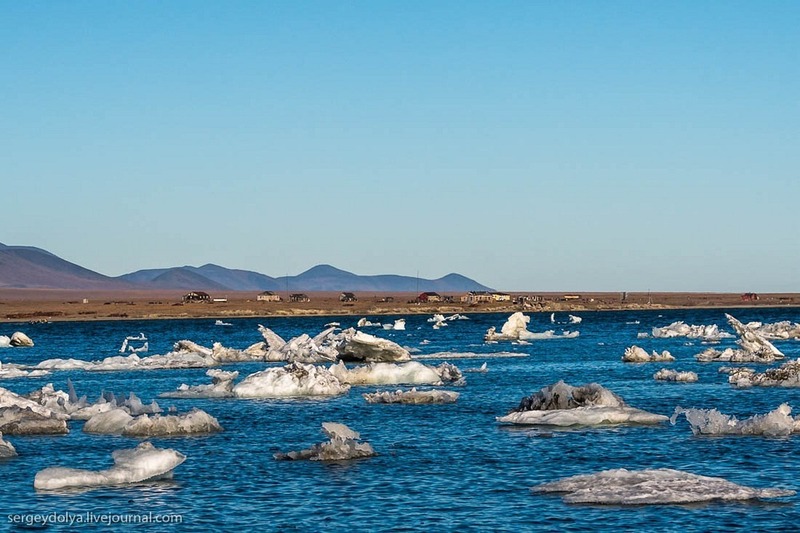 This harsh landscape supports a surprisingly diverse ecosystem, including Arctic foxes, seals, walrus, musk oxen, lemmings, and many types of birds. But the most abundant species here is the polar bear. There are so many ravenous bears roaming on the island that the handful of cottages and cabins here for the temporary habitation of research scientists and rangers have metal spikes built into the windows to prevent bear attack. Warning signs posted on the door remind people to watch out for bears when venturing outside. 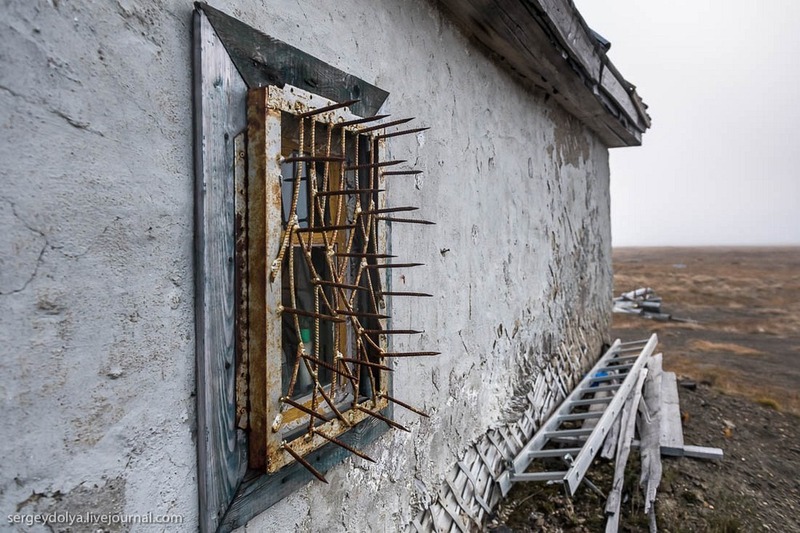 Spiked windows are required on Wrangel Island to thwart polar bear attacks. Wrangel Island has the highest density of polar bear dens in the entire Arctic region. The bears come here every summer when the ice melts, and stay on the island until winter and the start of the next freezing cycle. The bears also come here to give birth and raise cubs and prepare them for the next winter. The polar bear is actually a marine animal that love to spend its time in the water. Its preferred habitat is sea ice that covers the waters over the continental shelf and the Arctic Ocean. It usually lives on the edges of the ice sheet so that it could hunt for seals and other marine animals. But in the past few decades, change in the climate has forced the bears to spend more and more time on land because the ice now melts earlier and freezes later, elongating the ice-free period. Compared to 20 years ago, polar bears now spend, on average, a month longer on Wrangel Island. The number of bears that arrive on Wrangel Island each year is also increasing. In 2017, researchers counted 589 bears on the island, which was “abnormally higher” than the previous average of 200-300 individuals. The woolly mammoth died out about 10,000 years ago as glaciers melted and earth became warmer and hostile to the large beast. 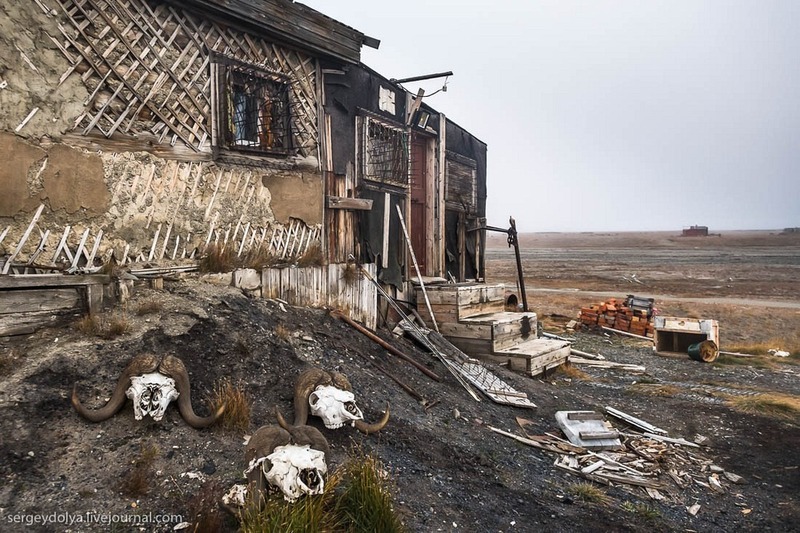 Shrinkage of its habitat and hunting by humans together caused the animal to disappear, but isolated populations survived in remote corners such as Wrangel Island, where the mammoth thrived as recently as 4,000 years ago. Possibly the last few hundred years of its existence, the animal coexisted with humans as carbon dating of various tools left behind by these prehistoric humans reveal. It is also possible that hunting drove the last of the surviving mammoths, on this frozen isle, to extinction. Today the island is littered with remains of the wooly mammoth such as tusks and bone fragments. 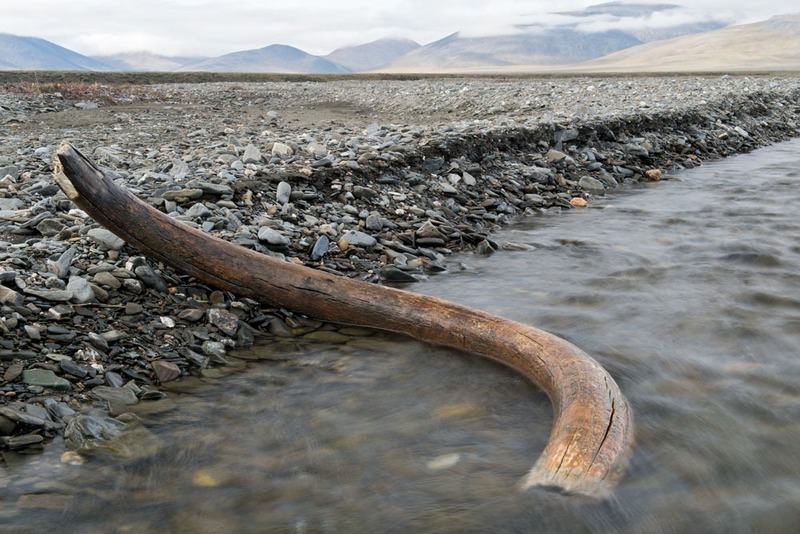 A tusk of a wooly mammoth lies on a stream on Wrangel Island. Unlike Canada and the US, polar bears are protected in Russia. The Soviet Union banned all hunting in 1956, but after the fall of the Union, there has been not enough law resources and poaching is still a problem. In recent years, polar bears have started to approach coastal villages in Chukotka due to the shrinking of the sea ice, endangering the lives of humans and raising the chances of illegal hunting. 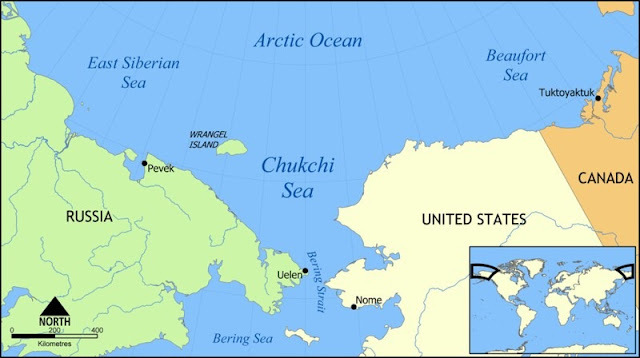 In 1976, the Soviet Union declared Wrangel Island and the nearby Herald Islands and the surrounding waters a state Nature Reserve. By the 1980s, reindeer-herding on Wrangel was abolished and the two settlements there were relocated. The island gained UNESCO World Nature Heritage Status in 2004. It is one of five UNESCO World Heritage Sites located inside the Arctic Circle and the only one which is listed for its marine values. Wrangel Island boasts the world’s largest population of Pacific walrus, with up to 100,000 animals congregating in the island’s rookeries, and the highest density of ancestral polar bear dens. 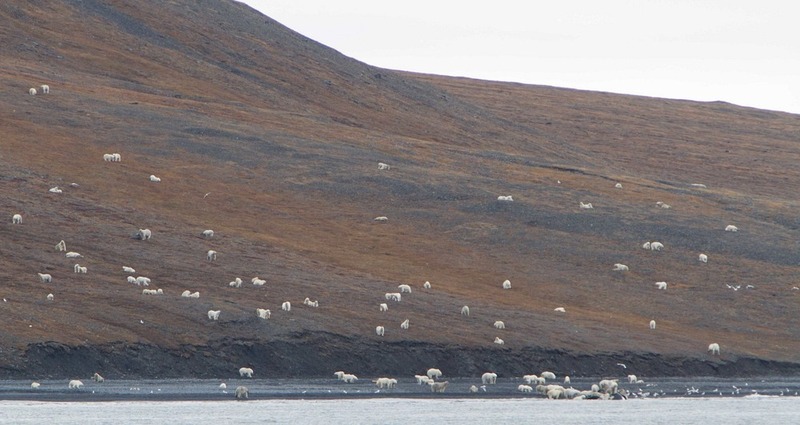 What appears to be sheep from the distance are actually polar bears. 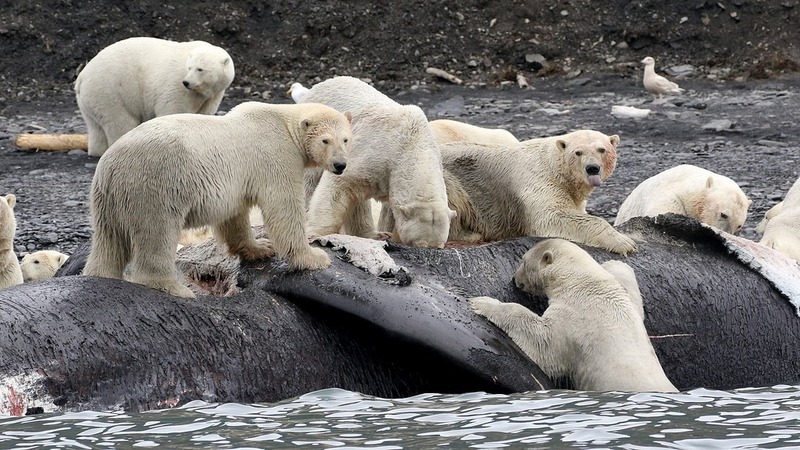 Polar bears scavenging on the carcass of a dead bowhead whale that washed ashore on Wrangel Island. Wrangel Island has no permanent population, but 6 or 7 rangers reside here to carry out various tasks, such as ecological monitoring of the wildlife, maintenance of the field huts, and working with scientific groups, researchers, and tourist groups who visit the island. The rangers live in a couple of rundown huts with windows protected by sharp metal spikes to prevent polar bear attacks. They are forbidden to posses weapons, but they do carry flare guns and pepper sprays. Facilities on the island are primitive, and conditions of the huts and the few vehicles in their reserve are very poor. They lack good repair kits and replacement parts, including tires, which make vehicle and communications breakdowns a constant challenge and create serious safety concerns at the site. Communication to and from the island is via radio signal, when conditions permit. Electricity is provided by diesel generators but the supply of fuel is not always guaranteed. Today, Wrangel Island is one of the least visited and most restricted nature reserves in the world. Tourist require special permit from the Russian authorities, which some say is a rather difficult process. An abandoned village on Wrangel Island. The residents were evacuated after Wrangel Island was declared a Nature Reserve. Abandoned cabins and oil drums can be seen on the site of a former settlement on Wrangel Island. An abandoned cabin on the site of a former settlement on Wrangel Island. 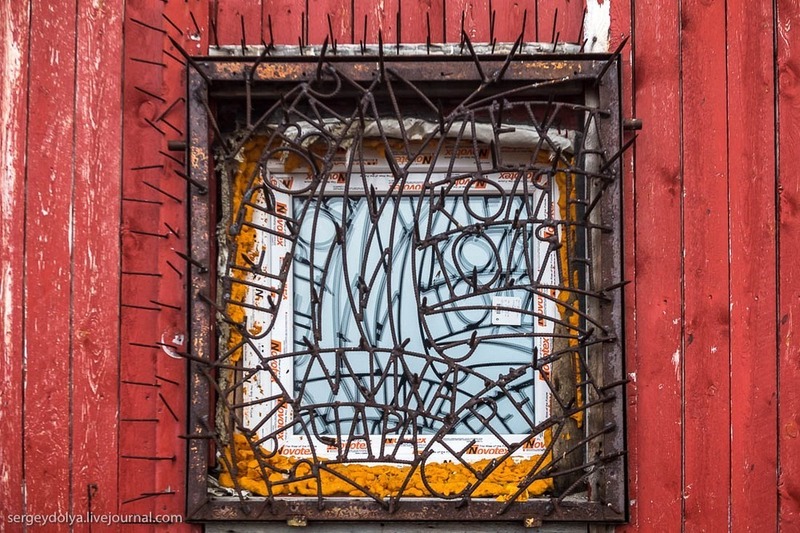 A window protected by metal spikes on Wrangel Island. 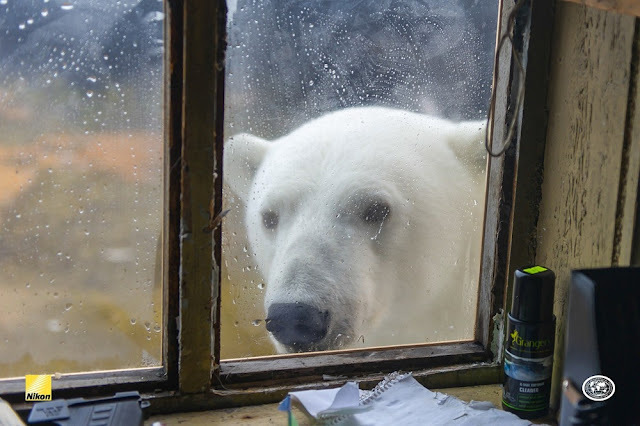 A polar bear peeks inside a cabin on Wrangel Island.